Home > PensionPartners > Data Dependent? Fed Policy Is Volatility Dependent ! Data Dependent? Fed Policy Is Volatility Dependent ! Janet Yellen and the Fed want you to know: they are “data dependent.” They aren’t just flying by the seat of their pants; they have a process by which they make monetary policy decisions. What that process is exactly is anyone’s guess, but “looking at the incoming data” seems to be a part of it. Fair enough. The Fed has never been particularly good at making forward-looking assessments of the economy, so the best they can do is look at the recent past and project that into the future. When the data weakens, they ease. When the data improves, they tighten. Or at least that’s how it used to work before the current cycle. The Federal Funds rate was moved to 0% in December 2008 during the worst recession since the Great Depression. The U.S. economy entered an expansion in June 2009 and while it certainly has been below average in terms of the growth rate, we’ve come a long way since that point in time. As I illustrated last December, it is the stock market tail that has been wagging the Fed dog in recent years. 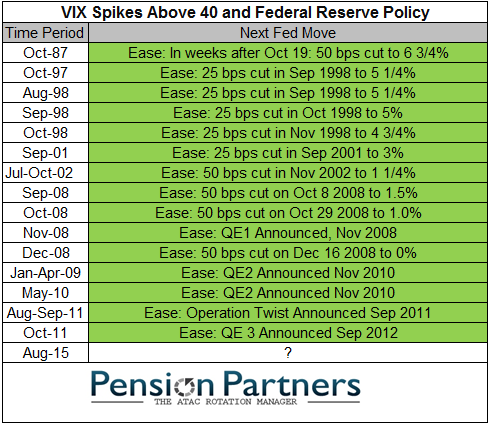 In 2010 and 2011 when the Fed was expected to begin “normalizing” interest rates, sharp stock market declines (17% and 21%) and spikes in volatility (above 40) derailed those plans and new rounds of easing (QE1/Twist/QE2) were initiated instead. Following the Fed playbook of the past twenty years, it would be difficult to argue that a tightening will occur in September. Historically, the Volatility Index (VIX) has crossed above 40 in the following years: 1997, 1998, 2001, 2002, 2008-09, 2010, 2011, and August 2015. The VIX was not yet created in October 1987 but we know that it certainly would have been well above 40 so we can include that as well. Following each of these prior spikes in volatility, the next Federal Reserve policy move was an easing, not a tightening. We know the easing response is a reflection of market volatility and not necessarily a change in the economy because not all of these periods were recessionary. 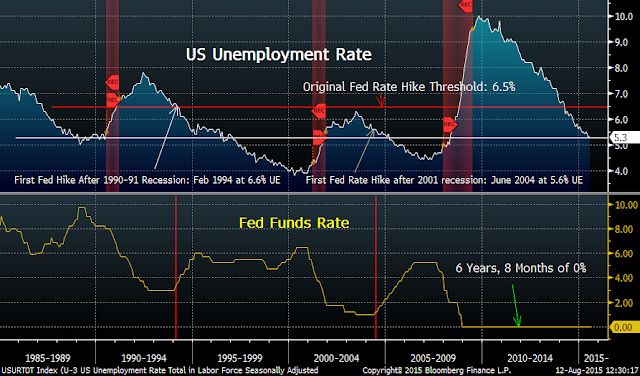 There was no recession in 1987, 1997, 1998, 2010, or 2011 and yet the Federal Reserve felt the need to act. Their goal was simple: prop the stock market back up with a flood of easy money. 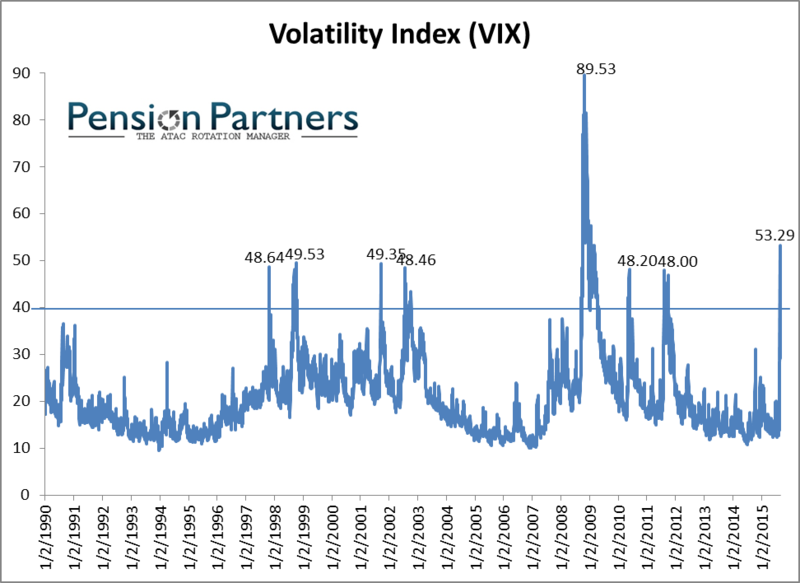 With the VIX spike above 50 last week, will this time be different? Will the Federal Reserve finally stand their ground, raise interest rates off of 0% and not react to the short-term machinations of the stock market? After almost seven years, we should all hope so. Why? Because 0% policy is not without costs, and is likely impeding long-term economic growth, borrowing from the future to satisfy the whims of today. We’re far past the point where emergency easing measures are helping the real economy and I have argued over the past year that it has actually become a headwind as it 1) is a tax on savings and therefore investing, 2) is leading to a gross misallocation of resources and capital, 3) is encouraging financial engineering (buybacks/mergers) over investments in capital/labor, 4) has already created the third financial bubble in the past fifteen years, 5) is putting less money into the hands of consumers, 6) is not helping real wages as asset price inflation (and rents) outpaces income gains, and 7) has only widened the wealth gap. To continue easing here because of stock market decline in the past two weeks risks any remaining credibility that the Federal Reserve has. It would serve as a final confirmation that the Fed is merely an instrument of the financial markets, whose sole purpose is to prop up stock prices, create new asset bubbles, and encourage ever higher debt levels.